Baccarat was founded in Paris in 1764. It has always embraced fine and artistic living. Baccarat is most know for its crystal, but the Baccarat luxury jewelry collection is just as stunning and well made as the crystal. Baccarat prides itself on unmatched hand craftsmanship. Their work was and is a standard in handcrafted finery. It started out as a glass works and has evolved over the years to include not only jewelry but items for the home and decoration of the home. Today the team of Baccarat includes numerous craftsmen who use their hands to create one-of-a-kind masterpieces. Today, Baccarat includes a pottery works, glass blowing studio, gilding, and engraving. 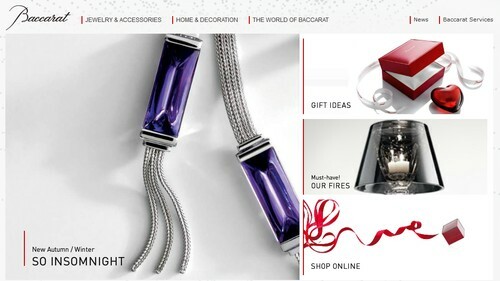 Baccarat luxury jewelry is unlike any other found today. Their designs are distinct among the jewelry of the world. They are classic and modern, beautiful and elegant. Most of the jewelry creations revolve around crystal. They are unique. Most of their crystal designs are smooth rather than cut and faceted. It is an understated elegance that marks their jewelry collections. They work in white and yellow gold as well as silver. The crystals come in clear as well as many bright colors. The Baccarat luxury jewelry collections mark just how distinctive this type of jewelry is. The Bouchons de carafe collection is made of cut clear crystal and yellow gold. It is eye catching and light catching large crystal set with detail. The designer is Elie Top. The Tentation Collection is marked by the shape of the crystal stones used. They are oval and flat but come in many different colors. The designs are simple but beautiful. The B Spirit Collection is also marked by a specifically shaped crystal design. These washer shaped crystals are clear and either colorless, gold, or silver. They are set in silver or leather. 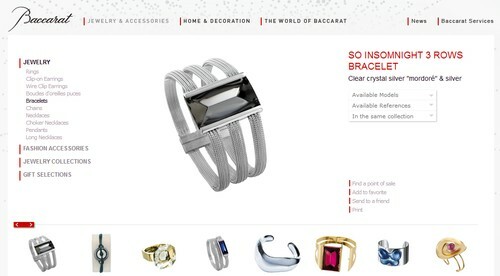 So Insomnight Collection is a distinctive and classic look in Baccarat luxury jewelry. These crystals are rectangular and have a cut and polished look. They come in several colors including pink, silver, and blue. The stones are generally set in silver. The Galet Collection is quite unique. The entire piece is made of crystal in undulating forms. It comes in colorless or onyx crystal. The Medicis Collection is quite different as well. It is a crystal in a pyramidal shape. It is set in rings, necklaces and bracelets in several colors including colorless, iridescent, black, silver, and bronzed.